Home > Colombia • Medellin > Margarita Mayo Comes to Medellin! Margarita Mayo Comes to Medellin! My sister Margaret May (name in Spanish is a very festive sounding Margarita Mayo) has arrived! We are so happy to have her visit, as usual. This is the FOURTH country she has met us in during our travels. She is my original Worldschooling Partner, since we lived in Spain together with our parents in 1983. 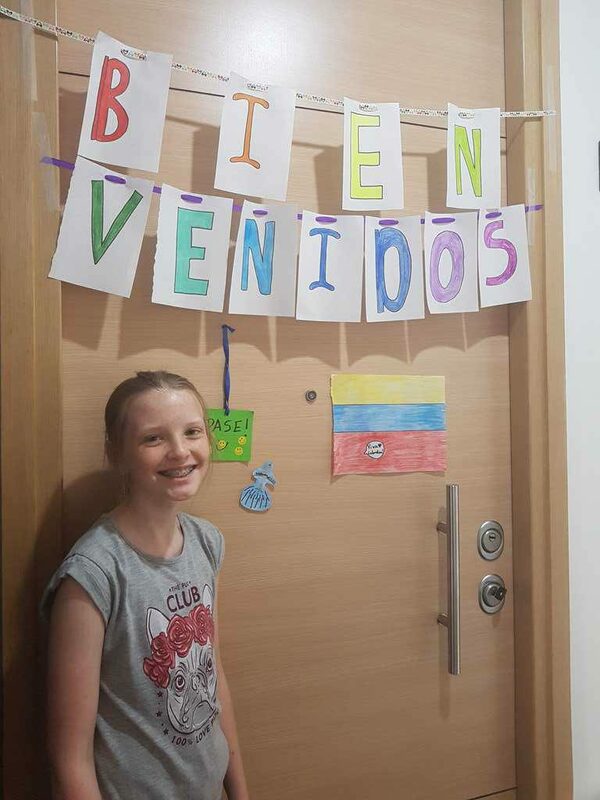 She visited us in Cancun in 2016, then Spain later that same year, then in Netherlands last year at this time and now she gets to join us in Colombia! She appreciates the shorter flight and minimal time zone changes this time. She does not appreciate that 75% of her allotted luggage was taken up by our Amazon mule. Ironically, the one place she did not visit us was when we lived in Panama. 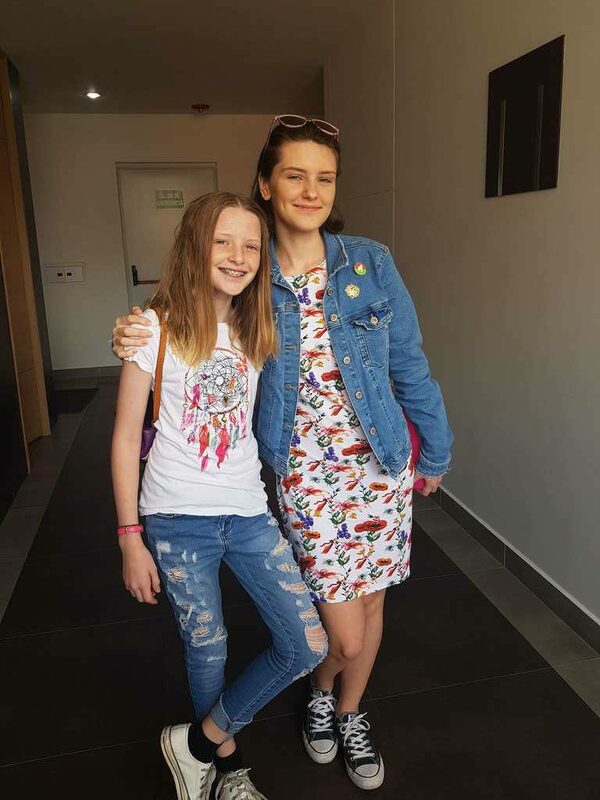 We talked about it a lot but I felt like it was not a great fit for her interests and it was not as easy to introduce her to our lives there, given how far we lived from the airport and how little there was to do for a tourist in Pedasi. Also, there’s the heat. Yeah, it’s just so hot there. Not her favorite. 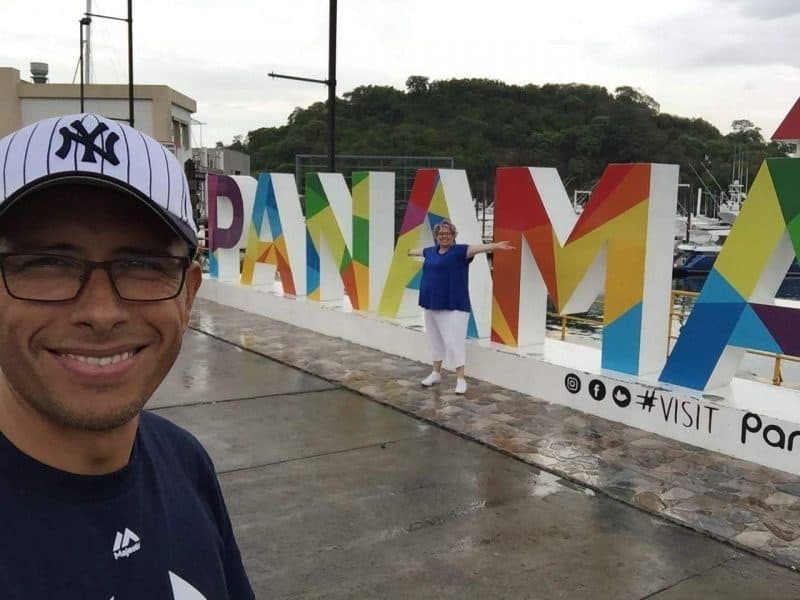 However, when booking her flight to Colombia we noticed the itinerary could easily include a layover in Panama City, so we booked an extended 24-hour layover to give her a chance to meet our good friend and tour guide Marc Vargas and do a quick city and canal tour. Maybe it wasn’t such a good idea to give Mar the layover on the way TO Colombia. The suitcase(s) she was hauling for us included a jigsaw puzzle, tons of candy, some electronics for Dan, a menstrual cup Haley was giving to a friend (the gift that keeps on giving) and some tailor-made eye pillows for Jamie, since she keeps stealing mine for her headaches. It was a crazy combo of items, only to be topped off by a brand new gaming laptop for Zoe, which had to be hand-carried and fretted about for the entire trip. 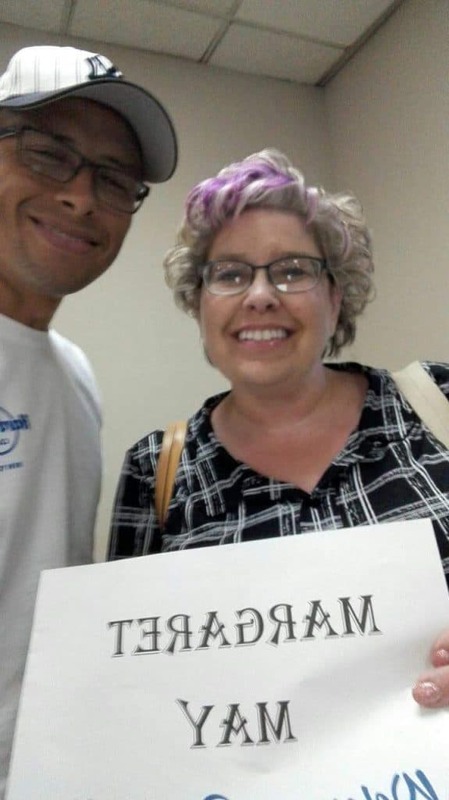 Marc picked up Margaret at the airport and in true “you never know what’ll happen” Worldschooler fashion, on the way to her hotel they witnessed a bus being held up by some thugs youths. Evidently, the technique is to throw rocks at the bus until it stops, then rob everyone on board. Good times. By the time Marc and Margaret arrived on the scene the police were arriving and there was a commotion at the back. They moved on. First impressions are everything. Well, I guess the first impression is when Mar walked out of the airport and her glasses fogged up. She’s like “is it always this hot?? ?” Shermans: “Yep”. Marc is always reliable and a great host to any visitor to the city! The next day Marc picked her up at 8 a.m. I guess he felt like he had a lot of things to show her. I think she felt slightly differently, but 8 a.m. it is! 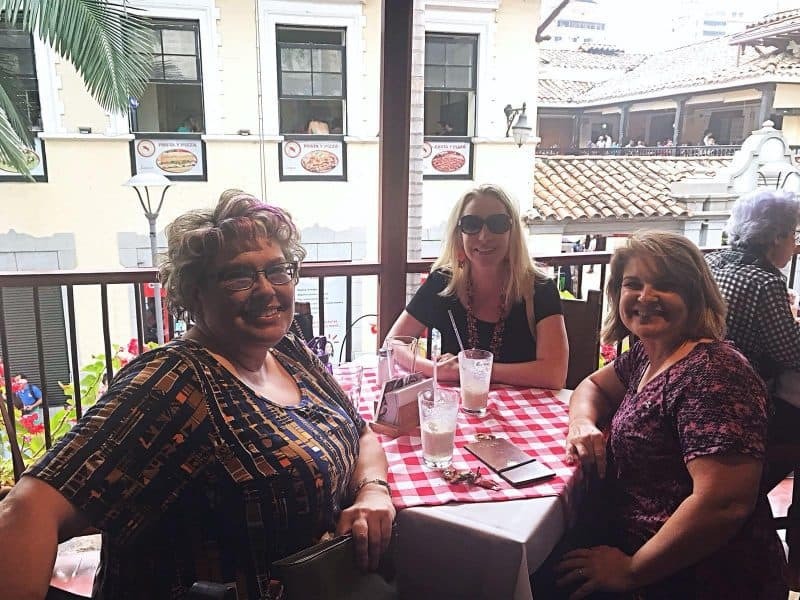 They had a great day touring the city, going to a nearby Panamanian village (Margaret was willing to give Marc a big tip if he could produce a sloth but he was unable), seeing the canal and then having a typical Panamanian lunch. If there’s a colorful country side, there’s a photo opp. 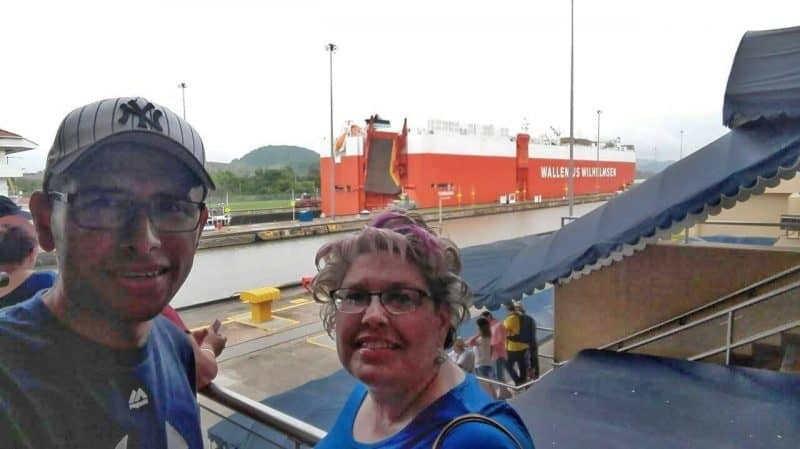 The Panama Canal – of course! Sorry… the photo was really dark and in trying to lighten it, we gave a skin disease to everyone. Finally after a day of sweating adventuring, Margaret was back at the airport, ready to get to us in Medellin. A short flight and she arrives, with all the treasures. We all know Zoe was happy to see her beloved Aunt Mar, but for some reason (read: computer) she was looking forward to seeing her aunt with even more enthusiasm than usual. Not gonna lie, 3 months of Zoe without her own laptop… well, we were happy to see Aunt Margaret as well. Door signs welcoming our visitor are obligatory. Note the Colombian flag! Margaret likes to shop, and not at a mall (although that works too) but more for little treasures. So I asked some friends where to take her and got some good suggestions for a market and some authenic Colombia treasures. My friends did not disappoint. Not only did a friend tell me where to take her, but she suggested that she would go with us, to show us the way! This was a great help and very typical of the Colombian hospitality. Off we went in a taxi, who deposited us at a park where they were having a monthly craft market. THIS is why I plan ahead – so we can hit the park and craft market at just the right time! We wandered the market, thinking this was why we came, but then my amiga Conny said “ok now it’s time to go to where I told you about”. What? More treasures? This is awesome. We walked down a pedestrian-only street that was filled with little shops. 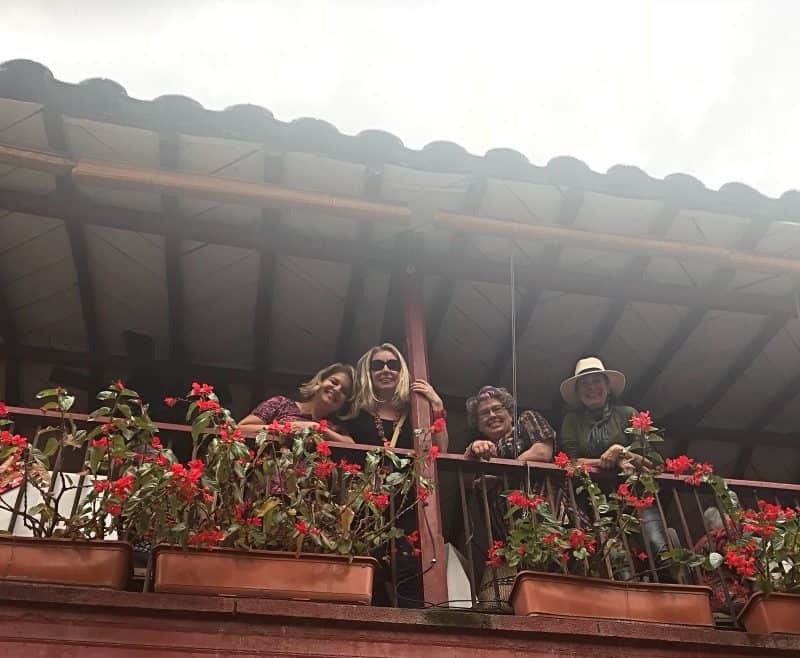 We discovered a 5000-peso store, (which is about $1.75 and just doesn’t have the same ring to it as “the dollar store”), a Colombian leather store, lots of street vendors, bakeries, restaurants, cell phone cases and pretty much everything in between. Just when we thought we’d seen all there was, Conny led us into what looked like a hallway but it turned out to be a big indoor market of nothing but Colombian momentos. This is fabulous! We had a great time shopping and learning about all the items and their significance to Colombia. Conny is a great teacher. Enjoying the street view and mild weather at lunch. Conny roped an employee to take our picture from the street. Upon reviewing this picture I seem to be invading Jamie’s personal space. Sorry, Neighbor! 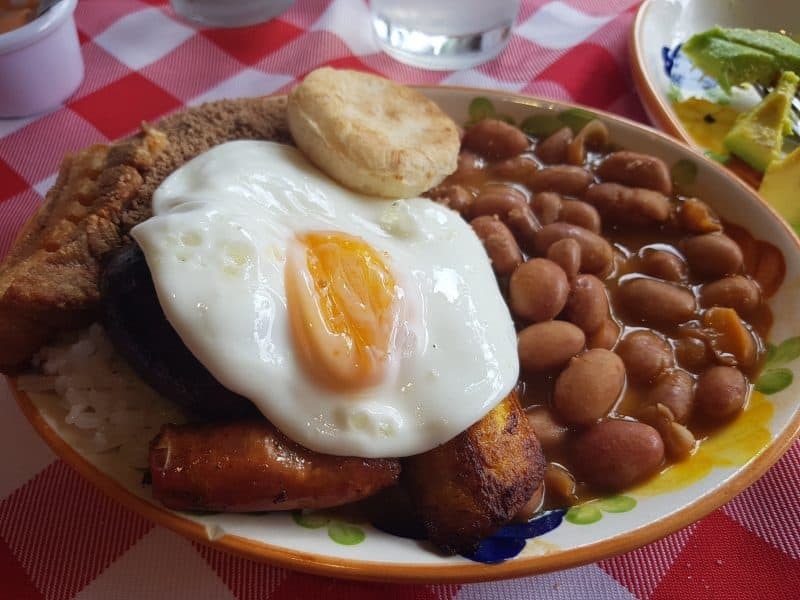 I had Bandeja Paisa – a very yummy lunch designed to feed the ranchers for many hours. Me: same. On Day 2 of the Margaret May Does Medellin, we took her first to the farmer’s market just down the street from our house. We went there via the major avenue near our house that closes down every Sunday morning and invites walkers, joggers, doggies and bikers to navigate without fear of being run over by crazy drivers. 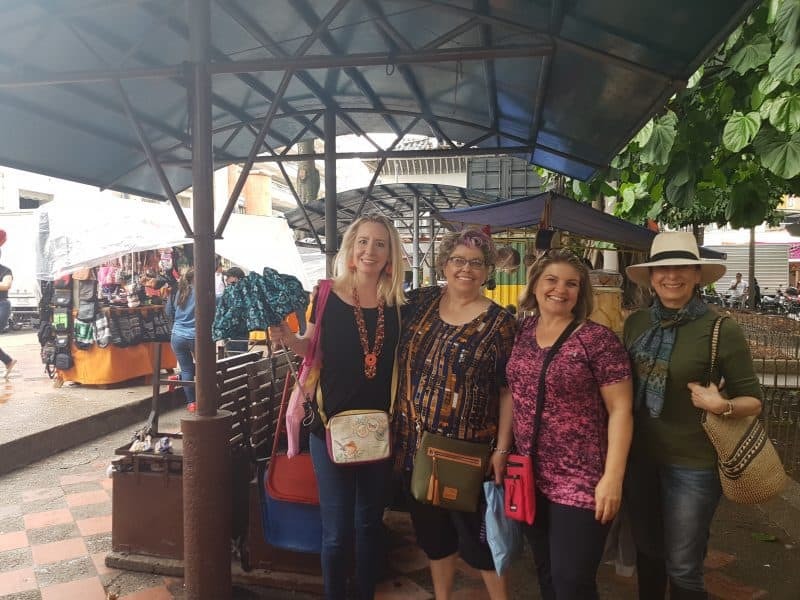 We stopped for coffee at Starbucks (our first choice, the Colombian cafe, was closed on Sundays for all you Judgy McJudgersons) and then made our way to the market, where Margaret tried all kinds of yummy Colombian treats. Margaret had to get a picture of Haley and Zoe, to share with her daughters, the cousins. Who are these children who look so grown up!!??? 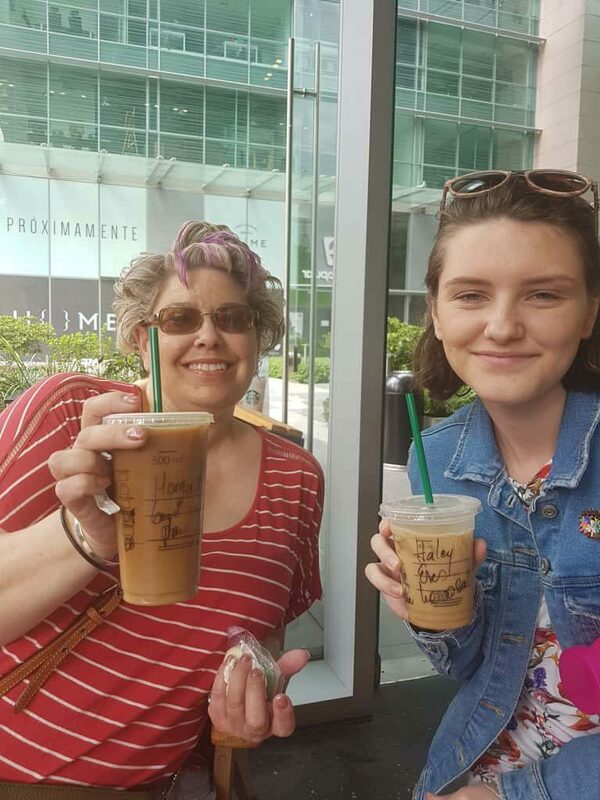 Margaret and Haley got coffee at Starbucks and we showed her how they always write compliments on the side of the cup. Super sweet! But not so sweet? 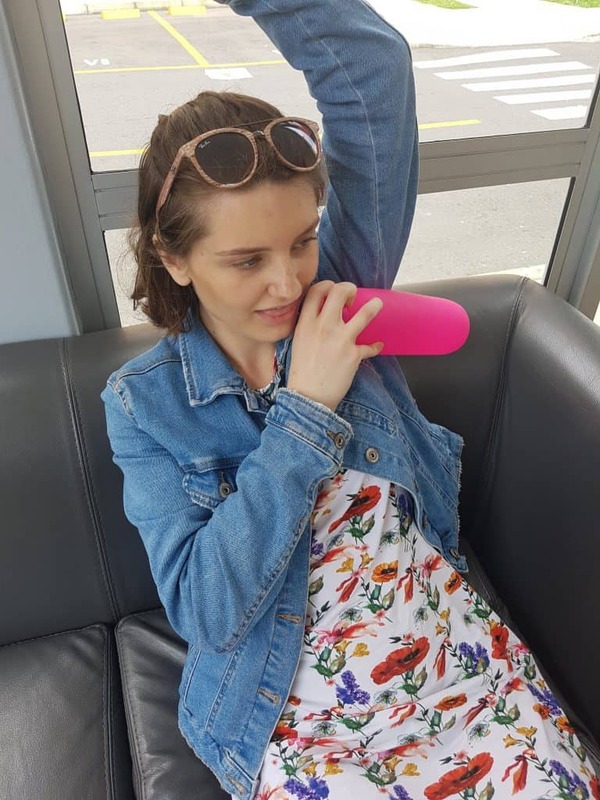 The single-use plastic. We are working on reducing/eliminating our consumption of that. 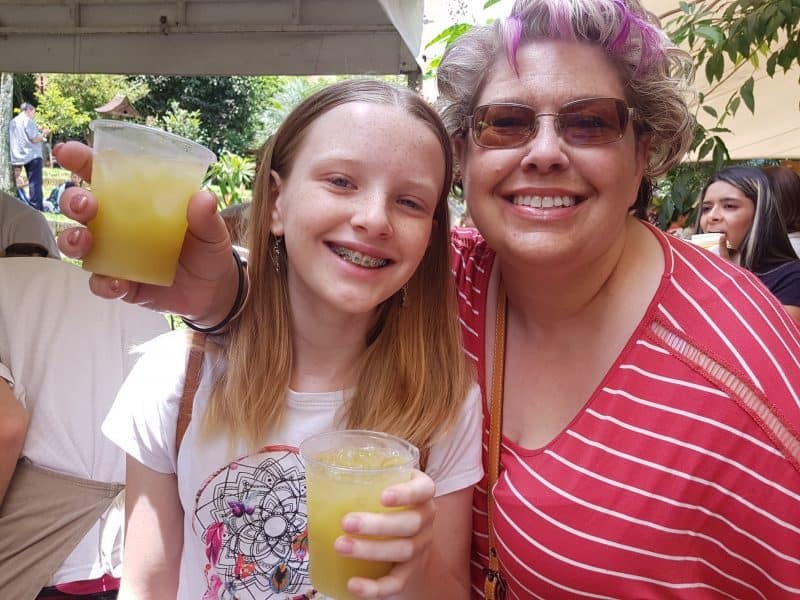 Not to be outdone by the coffee, Zoe got some fresh lemon / sugar cane juice to share with Margaret at the market. On the way back to our apartment from the market it was uphill and getting warm. 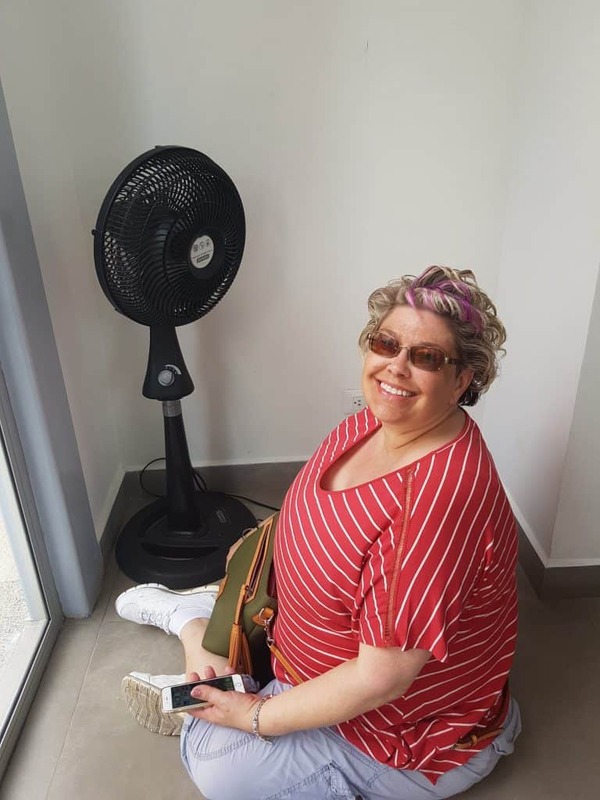 Mar took advantage of the fan near the door guards’ station. The door guards were still wearing jackets. Haley was hot too but she preferred the “suffer for fashion with a jeans jacket” method. Next we headed to Parque Berrio where they have the Botero sculptures. You’ve heard me mention Botero before so I won’t go into it again, but Margaret and I and Haley enjoyed the sculptures and subsequent museum. 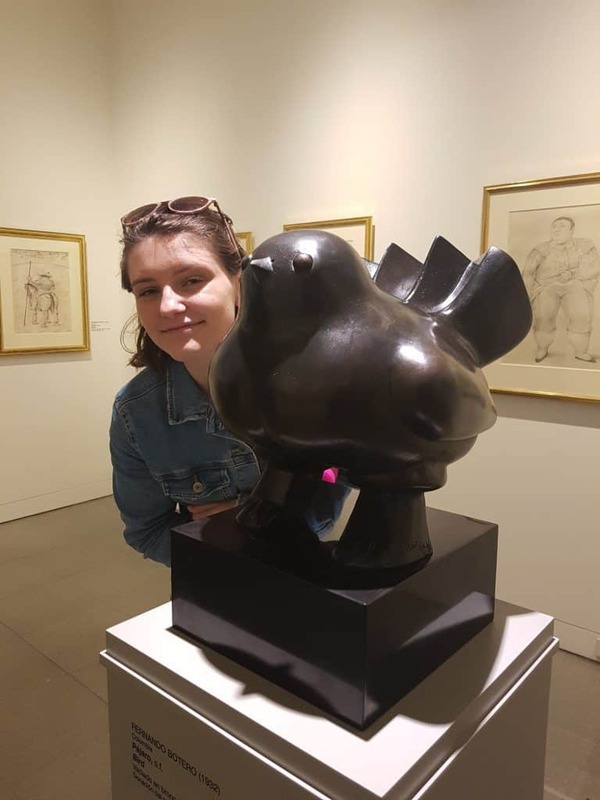 This is Haley’s favorite Botero sculpture – a fat bird! 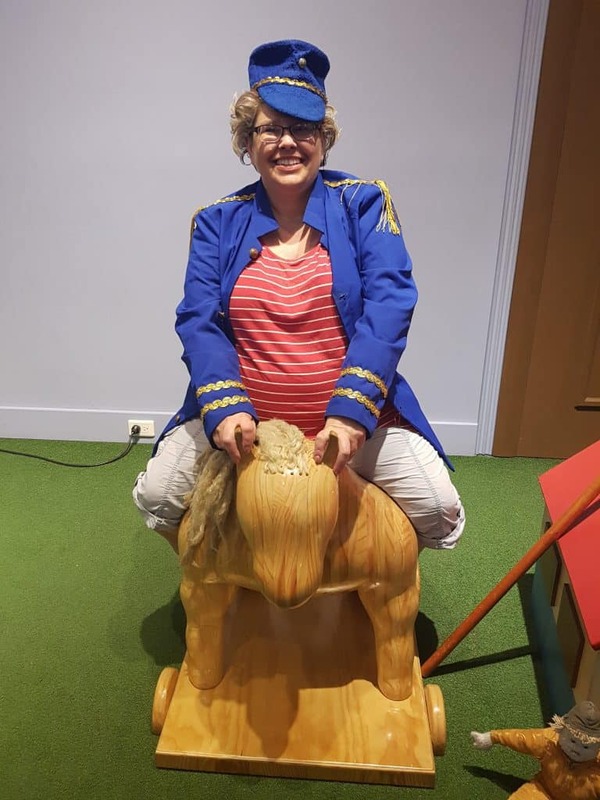 Margaret appreciated the kids’ area where she got to dress up like a Botero painting. Mar is such a good sport for all my picture ideas! It started to rain, as Medellin is prone to do this time of year in the afternoons, so we hopped in a taxi, the driver of which was not nearly as fun as the last one. This taxi driver gal was new to Medellin and we were unsure if her taxi would actually make it up the hill to the nice mall that was our next destination. We had to stop and ask directions several times even with Google maps on. But we finally made it to the mall up the hill from our house and we enjoyed wandering around, checking out the stores and the people. Malls are very busy on Sunday afternoons here in Medellin. Families, and lots of dogs, all come out for a stroll. We wrapped up our excursion with burgers from our favorite place in the mall and I successfully converted Margaret to be a fan of michelada con soda which is a lime, carbonated water and salt-rimmed drink that is super sour and sweet and definitely tasty. 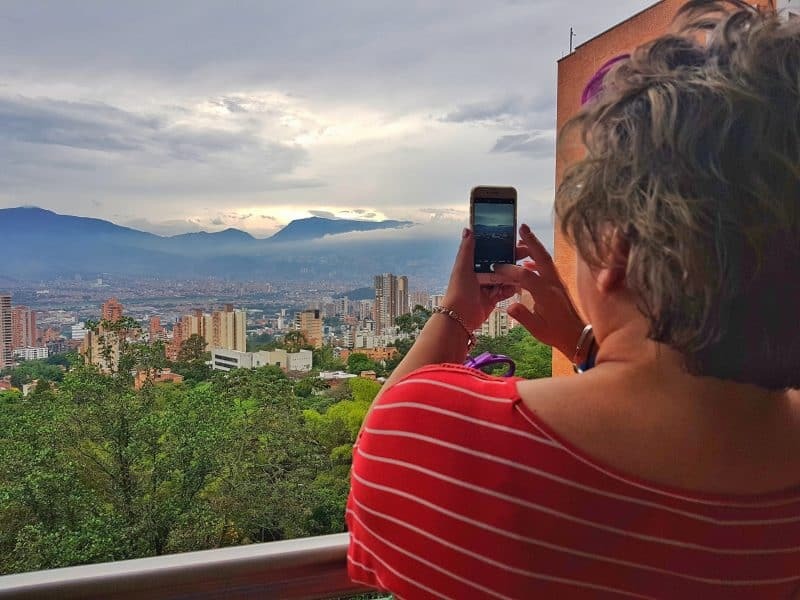 The view of Medellin from El Tesoro Mall is fabulous! The malls here are all indoor/outdoor (there are no doors) due to the weather always being in the 70s and 80s all year ’round. So that’s a wrap on Day 1 and 2 of M4: Margaret May does Medellin in May. Her visit was 8 days long so you can do the math on how many more blog posts we have on our adventures. You’re going to want to clear your schedule this week in order to be available to read all the blogs! See you in a few days.